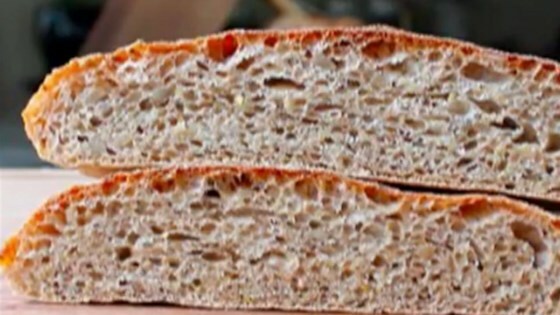 "I decided to give the old no-knead ciabatta a higher-fiber makeover. Since I don't have much whole wheat baking experience, I did what any good chef would do: I didn't do any research and just tried to figure it out. I was quite happy with the taste and texture, and going 50/50 with the all-purpose flour provided just enough of that crusty, chewy ‘normal' bread experience." Stir 1 cup warm water, 1/2 cup all-purpose flour, 1/2 cup whole wheat flour, 1/4 cup rye flour, and yeast together in a large bowl. Cover the bowl with plastic wrap and let sit until the sponge bubbles and doubles in volume, 5 to 6 hours. Stir 1 cup all-purpose flour, 1 cup whole wheat flour, 1/2 water, sunflower seeds, polenta, flax seeds, salt, and honey into sponge with a wooden spoon until a very sticky dough ball forms, about 3 minutes. Scrape down the the sides of the bowl, cover bowl with plastic wrap, and let dough rise until doubled in volume, 10 hours to overnight. Line a baking sheet with parchment paper. Dust parchment paper with 1/2 teaspoon all-purpose flour and cornmeal. Scrape dough out of bowl onto a lightly floured work surface, press down to remove air, and form into a smooth oval loaf. Place dough on the prepared baking sheet. Dust top of loaf lightly with flour, cover with plastic wrap, and let rise until doubled in size, about 1 1/2 hours. Preheat oven to 450 degrees F (230 degrees C). Place a baking dish filled with water on the bottom rack of the oven. Remove plastic wrap from risen dough and mist the top of the dough with water. Bake loaf in the preheated oven, misting the top of the loaf with water every 8 to 10 minutes, until loaf is golden and sounds hollow when tapped, 30 to 35 minutes total. Transfer bread to a cooling rack and let cool completely before slicing. Very simple to make and it tastes great. Delicious! Crisp crust, delicious flavor. I will make this again and again. Gone in 2 days! Easy recipe. PLAN IN ADVANCE. Yummy texture. Super easy to make.